Wiccan healing spells can help direct beneficial healing energy towards a loved one or even to yourself during a time of illness or injury. These rituals aren't a replacement for actual medical care, but you can still speed up the healing time with a little magick anyway. I don't usually write spells that involve any Deities because it allows people to use these spells no matter what their specific path is. Anyway, this is one exception. As you can imagine, this spell also must be done on the night of the full moon. It's a spell written for healing of yourself, not another person. If you absolutely must do it inside, find a window with a good unobstructed view of the moon. Bless my body and my soul. Now, gently wrap the strip of cloth around your body where you need to direct the healing energy. It's just symbolic, so it doesn't have to be perfect. If it's your whole body, then wrap it around your torso. Repeat the healing request again. 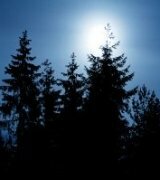 Stand in the moonlight for a few more minutes and visualize the healing energy around you. Remove the cloth and put out the candle. Wrap up the cloth into a little bundle and keep it in your bedroom until you are fully healed. This is a more general healing spell that is better for less-serious ills when you just need a physical pick-me-up. Annoit the tip of the rosemary sprig with your oil and gently trace the sign of a pentacle on your chest/belly area. Yes, you need to be shirtless for this. Touch the sprig to each of the points, and say "Earth, air, fire, water, spirit" with each one. Picture the purifying nature of the symbol cleansing your body of your illness. Take a long drink of water, and bury the piece of rosemary outside. Hopefully these Wiccan healing spells will help you next time your physical body needs some healing energy. Leave the Wiccan healing spells page, and go back to the main pageof healing spells.